TCM will air the historical drama Friendly Persuasion (1956) at 8 p.m. May 23 as part of its Essentials series. The film stars Gary Cooper as a peace-loving Quaker who is trying to keep his family together during the Civil War. I'll outline three things to look for while you're watching after the jump. 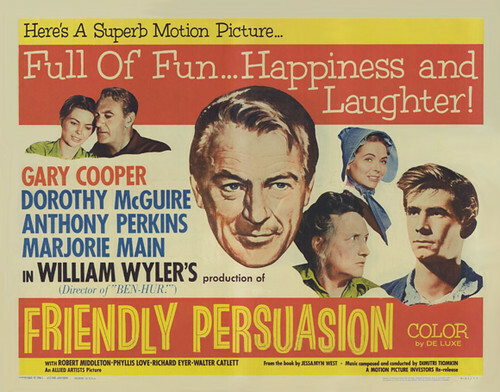 Director William Wyler's Friendly Persuasion was one of the most unusual Hollywood hits of 1956. The movie tells the story of the Birdwell family, Quakers living in rural Indiana who are trying to maintain their peaceful way of life during the Civil War. Parents Jess (Gary Cooper) and Eliza (Dorothy McGuire) struggle to keep their family together when Confederate raiders invade Indiana, especially when their teenage son (Anthony Perkins) runs off to fight with the Union. A vintage poster for Friendly Persuasion (1956). Quaker Way of Life: There aren't many films that deal with the everyday life of people of faith, but Friendly Persuasion does a fine job of dealing with the Quakers, a Christian sect that was quite active in the 19th century. The Quakers had a strict dress code and strict morals -- no dancing or musical instruments allowed -- but they were actually quite progressive for the time period. They believed in equal rights for women -- Eliza is the local congregation's minister -- and they were leading abolitionists. Quakers were also pacifists. They did not join the military or approve of war, and Quakers viewed even a fist fight as a violation of God's law. Friendly Persuasion does a fine job of dealing with Quaker beliefs: It's one of the few movies that doesn't equate pacifism with cowardice. Wyler shows the real struggle both Jess and his son go through when they are forced to decide between defending their homes or following their deeply held beliefs. Thee I Love: Many fifties films contained lush romantic ballads that helped bring teenagers to the box-office. Friendly Persuasion was no exception even though Quaker beliefs forbade musical instruments. Composer Dimitri Tiomkin and lyricist Paul Francis Webster wrote "Friendly Persuasion (Thee I Love)" as the movie's theme song. "Thee I Love" is a clever riff on the Quaker's old-fashioned way of speaking in "thees" and "thous" with lyrics like, "Thee pleasures me in a hundred ways/Put on your bonnet, your cape and glove." Teen idol Pat Boone recorded the song for the film's opening credits, but The Four Aces also had a big hit with the love ballad. Anthony Perkins: Perkins will be forever remembered as Mama's boy Norman Bates in Psycho (1960), but he got his big break in Friendly Persuasion, playing the Birdwell's sensitive son, Josh. Perkins was a little known theater actor when he got the role. The producers wanted James Dean, but his manager refused to consider him for a supporting role, so they turned to Perkins, who only had one other film to his credit (The Actress in 1953). Perkins gives a fine, sensitive performance as a young man caught between his duty to his country and his deep love for his family and faith. 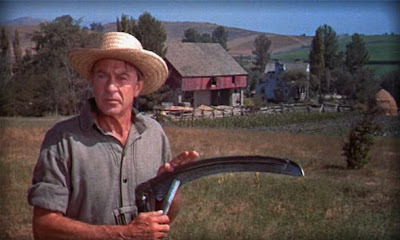 Perkins received a Best Supporting Actor Oscar nomination, but he lost to Anthony Quinn, who played painter Paul Gauguin in Lust for Life.